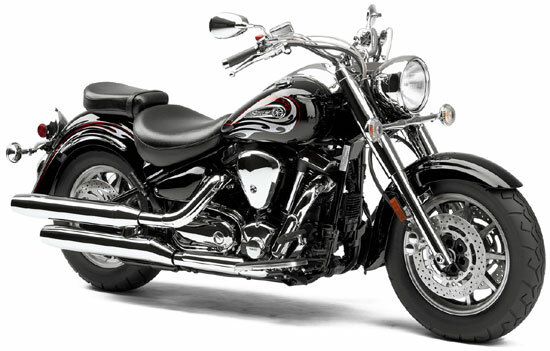 The 2010 Yamaha Road Star S features a fuel injected V-Twin with muscle to burn and plenty of chrome. It’s as easy on the eyes as it is easy to ride. 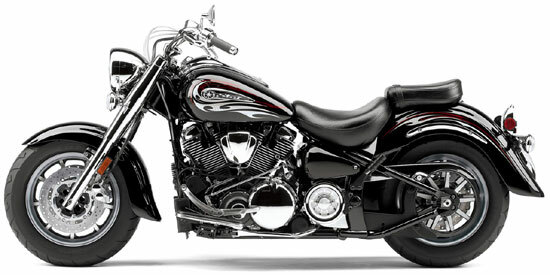 Another winner in the legendary Yamaha Star series. 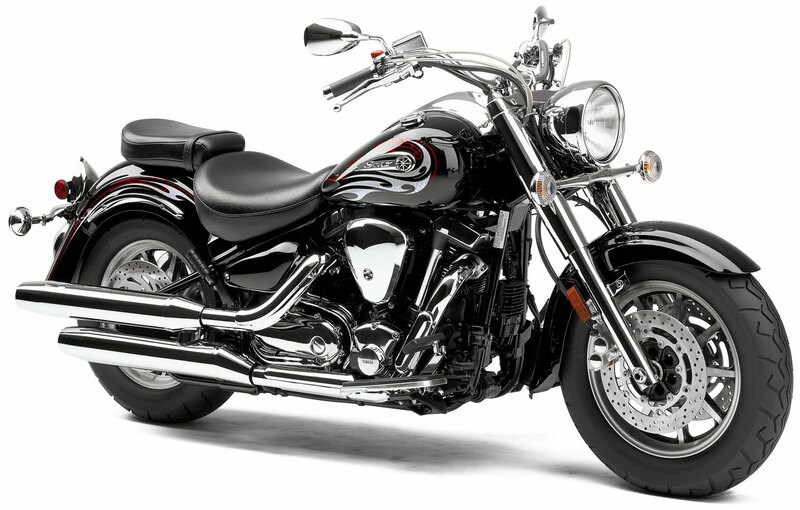 The Yamaha 2010 Road Star is one of the biggest, baddest air cooled V-Twins in the business. It looks good, due mostly to the classic appeal of that hardtail-looking streel frame and all the classic looking hardware that goes with it. The 2010 Road Star S gets chrome accents to the front end including chrome switchgear, front brake master cylinder, front fork and levers. ” The Road Star S gets chrome accents to the front end including: chrome switchgear, front brake master cylinder, front fork and levers. ” 102-cubic-inch (1670cc) V-twin powered beauty in a long and low hardtail-look frame, with plenty of customization potential built in. Modern engineering and materials, including ceramic-composite cylinder liners for superior heat dissipation. ” Air cooling, hydraulic valve lifters and belt final drive reduce maintenance requirements to a minimum. ” Computer-controlled fuel injection monitors multiple engine parameters to calculate perfect mixture under nearly all conditions. ” Air cooling, hydraulic valve lifters and belt final drive. Reduces maintenance requirements to a minimum. ” Smooth-shifting five-speed transmission delivers outstanding cruising performance with low rpm at highway speeds. ” Electric starting system features solenoid-activated auto decompressor for easy, dependable starting. ” Extra-long 66.5-inch wheelbase creates long and low retro profile, added rider comfort for a great ride. ” Telescopic 43mm front forks with stainless-steel covers and 5.5 inches of travel stylishly smooth out the bumps. ” 16-inch cast wheels shod with tubeless tires for a classic look while providing confidence-inspiring handling and excellent grip. ” Industry-leading Star family fit and finish mean lustrous paint and extensive chrome accents that create a machine as stunning as it is powerful. ” Full-size floating-type rider floorboards with replaceable wear pad are roomy and comfortable. ” A two-piece heel/toe shifter and braided stainless clutch and throttle cables add even more comfort and style. ” Large-diameter, forged pistons offer great durability and lighter weight for fast response. ” Dry sump lubrication system with handy spin-on oil filter, creates a lower centre of gravity by helping reduce overall engine height. ” 2-piece heel-and-toe shifter adds versatility and enhances the overall cruising experience. 2-piece design allows the rider to individually adjust front and rear portions to suit foot size or remove the rear section if not desired. ” 43mm front forks with large-diameter covers and 140mm (5.5″) of wheel travel smooth out the ride. ” Spring preload-adjustable, single-shock rear link suspension lowers centre of gravity for excellent handling and a plush ride. Rear wheel travel is 110mm (4.3″). ” Rear shock is horizontally mounted under the engine and tucked out of sight for that classic, hardtail look. ” Dual 298mm front disc brakes feature R1-inspired, one-piece, 4-piston calipers with chrome “buttons” accenting the outer piston covers. The dual disc brake set-up eliminates the unsettling twisting effect of a single disc set-up found on many cruisers. ” Nine-spoke, cast aluminum front and rear wheels not only reduce weight and maintenance (no spokes to tighten), but they also add a sportier styling image to the Road Star S. Since these are mag wheels, they are fitted with bias ply, tubeless-type tires. ” Tank-mounted speedometer features an extremely stylish design with raised 3D marks to highlight the speed graduations. Instrumentation includes odometer, dual tripmeters, clock and a fuel gauge plus a range of indicator lights. 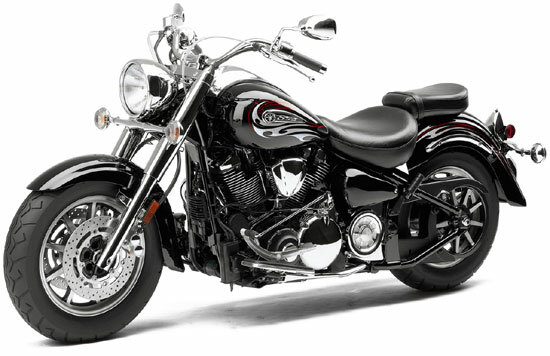 ” Extra wide chromed front brake and clutch levers provide a quality feel.